Paradip Mar 10. 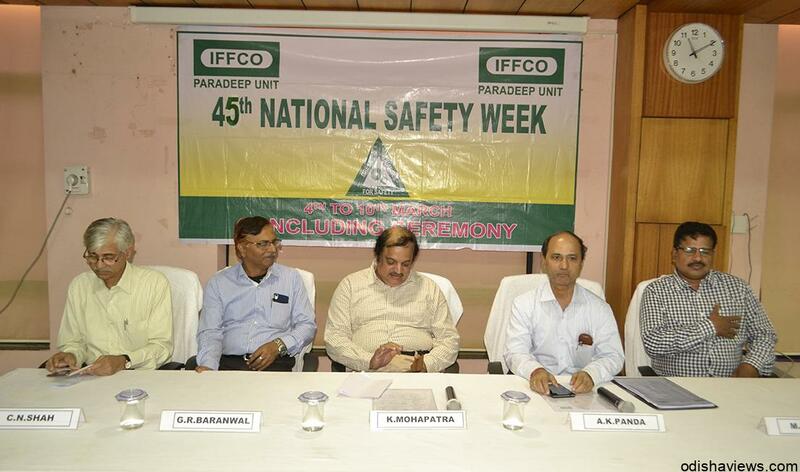 The 45thNational Safety Week was celebrated by IFFCOParadip unit from 4th March to 10 March and concluded on Thursday ,During this annual clebration employees of IFFCO, Contract workers, DAVschool students and family members of the IFFCO Township had activelyparticipated. On the closing day occasion, MrKamalendu Mohapatra, Deputy Director – Factories & Boilers was attended asChief Guest followed by Mr Manoj Kumar Panda, Asst. Director (F&B) Mr Ashish Kuamr Panda Unit Head ofIFFCO Paradip Unit were present as Guests of Honour. The Chief Guest of thefunction Mr Kamalendu Mahapatra spoke about general awareness of the week amongthe employees’ safety and be expanded to personal life and its being celebratedin the colleges and schools. The Safety Department ofIFFCO Paradip had organized Drawing, Quiz competition, Essay competitionamongst the employees and partners, stakeholders and the school children duringthis Safety Week and awarded prizes to many. All family members of IFFCOtownship had also actively participated in this programme.